Andrei Tarkovsky was a master who led the way for an entire generation of talented film directors. He would have turned 80 on April 4 2012. 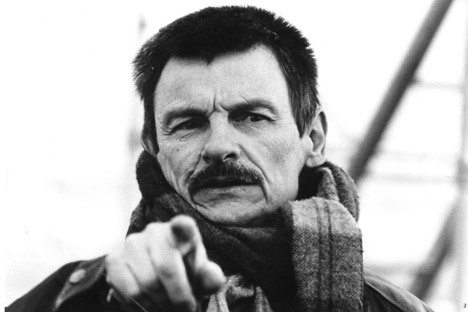 Despite numerous ideological difficulties, Russian film director Andrei Tarkovsky was able to make his “seven-and-a-half” films (seven full-length feature films, one short, and one documentary) the way he wanted. That way, he managed to not only express the beauty of his soul, but also change the course of world cinematography. As Tarkovsky himself used to say, he spent his whole life making just one film - a film about man and the search for truth, for the ideal. Tarkovsky, a student of Mikhail Rom, was a leading figure among the new breed of talented directors who came to film in the early 1960s, bringing with them their own topics, problems, and worldview. Tarkovsky’s feature-length debut, “Ivan’s Childhood,” was awarded the Golden Lion at the Venice Film Festival. He followed this auspicious beginning with “Andrei Rublev,” “Solaris,” “Mirror,” and “Stalker”. He made three more films while in forced exile from the Soviet Union: “Nostalghia,” “The Sacrifice,” and the full-length documentary “Voyage in Time,” which he shot with Tonino Guerra. As for how Tarkovsky was received in his home country, the numbers speak for themselves: “Stalker” came out in 1980, with just 196 prints, only three of which were allotted for the whole of Moscow. But within months of its release, two million people had seen the film. In the early 1980s, Tarkovsky was invited to shoot a movie in Italy. He never returned to Russia. Although “Nostalghia,” which was written with Guerra, was, on the whole, apolitical, it still caused suspicion. So when the opportunity to work abroad arose, Tarkovsky jumped at the chance. The Soviet authorities made repeated demands that he return, but Tarkovsky refused and was declared a traitor. Nikolai Burlyaev, a People’s Artist of Russia who was cast in Tarkovsky’s films, said the filmmaker was deeply religious, that he was forever searching for, and moving towards, God: “This can be felt in every film he made,” Burlyaev said. Tarkovsky died of cancer in France in December 1986. He was buried in the Sainte-Geneviève-des-Bois cemetery not far from Paris. The following words are engraved on his tombstone: “To the man who saw an angel.” Visitors to his grave will notice that it looks like a frame of film. A few flower pots are planted around the rectangular, dark-soiled plot, a tree leans over the tombstone shedding its leaves evenly on the tomb, a braid of white pearls encircles the cross – a necklace left by the preeminent Soviet filmmaker and scriptwriter, Sergei Paradzhanov. Tarkovsky believed that film should contribute to the process of improving the lives of people worldwide, and all his films reflect his commitment to this idea.